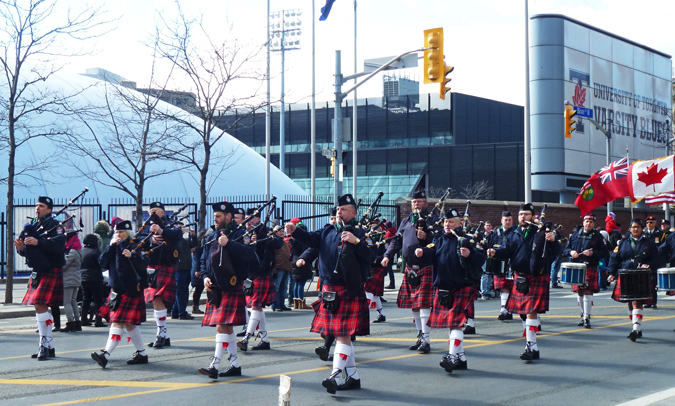 There were several pipe bands in the St Patrick's Day Parade and this was one of the most striking ones with everyone in their red plaid kilts. This pic was taken on Bloor St near the beginning of the parade in front of Varsity Stadium which is the playing field of the U of Toronto. You can see the bubble which covers the field at this time of year. It was a windy day so a kilt wouldn't have been the warmest outfit to be wearing! ...a common sight and sound in parades here too! A parade would not be the same without the pipers. Their uniforms do look very smart - they just need to pull their socks up higher to keep warm! LOL! They have a long and drafty walk ahead of them! Wonderful capture, Pat! I can hear the pipes! I can just hear the sound of the pipes! Some university or other athletic facilities here use that kind of dome over the winter as well. Love the sound of a pipe band. I can almost hear the music in your photo. I love the sound of bagpipes. Bagpipes are awesome sounding instruments. I enjoy a good pipe band. but I agree that the kilt is not exactly the best choice for this kind of weather. And they're all in step, too. Mostly. Just the right combination for the occasion. Oh la! Windy days and kilts can be quite tricky 😀 love pipe bands Pat, they look so smart. São bonitos os kilts vermelhos e gostei da foto. Os dias frios com céu azul me encantam. What a wonderful musical experience!